I have been busy recently, and the ever-present backlog of photos and so on I mean to post gets ever longer. 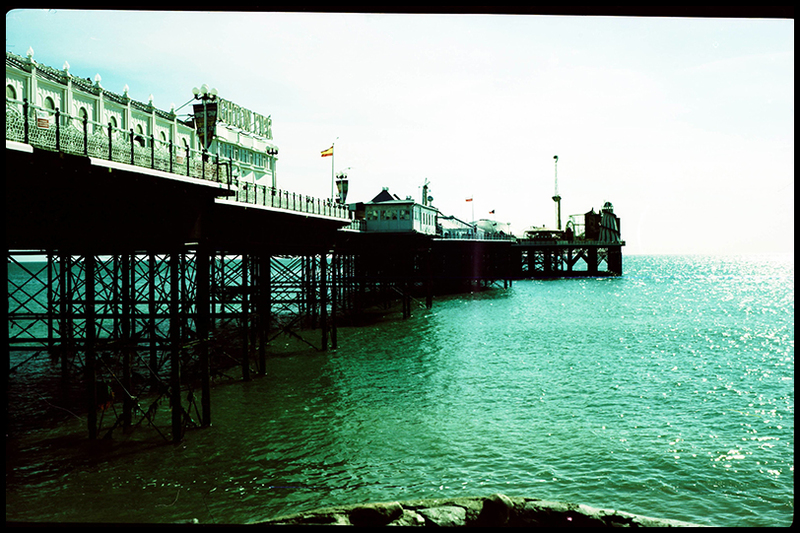 Here’s some photos I took of Brighton Pier at some point. 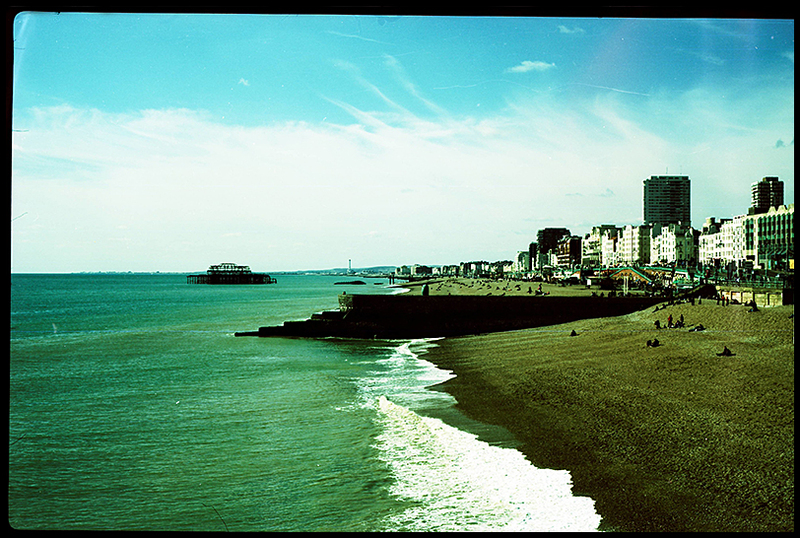 I have no idea when I took them, probably when I lived in Brighton, but I scanned them the other week. They’re taken on my Moskva 5, the most awkward camera I’ve ever had the (dis) pleasure of using. It’s an all metal Russian medium format beast that I got in a junk shop in Tallinn. You have to use a tripod and shutter release with it, all that’s missing is the fabric hood and flash-pan of magnesium powder for the full effect. There’s a clockwork mechanism that is supposed to prevent double exposures, but which just succeeds in locking the film advance for no reason most of the time. It has no meter, and I don’t have a working handheld meter any more, so I just eyeball the exposure with the sunny 16 rule. The resulting negatives are huge (6×9 format, there is supposed to be a 6×6 mask too, but I don’t have it), you get about 6 pictures per roll of 120 film. I've seen an English coast in Eastbourne. It's so very different from the Gulf Coast (along the panhandle of Florida, Alabama, Mississippi, etc.) that I've spent all my life along. In my imagination…these brown beaches and boardwalks are some of the most English images. If I close my eyes and think about England…after I get through the images of “business girls” and dope pushers at King's Cross Station…the shore comes to mind next. Yeah, those are the most common types of beach over here. We have sand ones too, but they're still not like the Caribbean ones. That's why there's so many British tourists in places like Florida and Barbados. Kings X/Somers Town is massively improved these days! Kings X and St Pancras had big facelifts/rebuilds and are very fancy stations now (St Pancras is the terminal for the Paris and Brussels trains now), and the British Library is also there these days in a big new building with exhibition galleries and big cafe. There's also the Wellcome Collection too, a free museum of medicine and science-related art which is very popular. I was often in the area from 99/2000 or so to see bands at the Scala and the Water Rats. It was pretty grim round there (albeit in a way I'm familiar with from where I grew up), and then suddenly a few years ago it really cleaned up its act. Suddenly all the hourly “hotels” and dodgy characters on the street corners are gone. I don't know where they've gone to though. Must be somewhere in London. I was in and out of there from 94 to 97. I stayed at the No. 1 (right across from the station)…it was cheap. I payed for entire nights at a time though :). It was run by a really sweet Maltese lady. Sadly she had passed away the last time I was by. Even back then there was talk of revitalizing the are but, to that point, the only thing that had been built was a burger king and a Kentucky Fried Chicken. Glad to hear that it's been scrubbed up so well. That all sounds kinda swanky. Of course, I still do have a lot of fondness for the grimy place I remember.